Surrounded by family, Janet Selma Phyllis Scholz (Kaeding) passed away on Sunday, December 2, 2018, at the age of 93 years and 7 days. 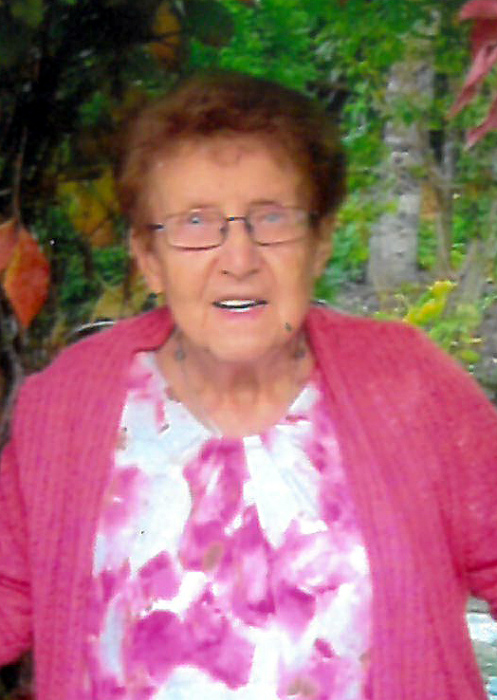 She has been joyfully reunited with everloving husband Paul, who predeceased her February 20, 2008. God has taken Janet home to rest in the arms of Jesus. Janet was given life by her creator and was born on the Kaeding Farm south of Churchbridge. She was the second oldest of four children. Janet was reborn as a child of God in the waters of Holy Baptism and later confirmed at First English Evangelical Lutheran Church in Churchbridge. She often sang in Junior Choir or duets with friends while sister Delores was the organist. During her school years, she was active in the Local Grain Club and the Girl Guide Program. Growing up in the Depression Era, under federal payments starting in 1933, Janet assisted the hired girls in the farm house (total 12) until wartime in 1939. From 1948 – 1950, Janet worked at St. Paul’s Hospital in Saskatoon. Janet taught Sunday School at the School of the Deaf in Saskatoon. She was joined together in holy matrimony to Paul Scholz on July 17, 1949. They started housekeeping in a tiny apartment above the John Deere Agency in Langenburg. Janet started work that fall at Langenburg Hospital located in the Town Hall, then later working at the Langenburg Union Hospital until 1952. In spring of 1952 Paul announced that ‘we bought a farm’, much to Janet’s shock. The farm was one mile south of Churchbridge. A tiny house, no power, some old buildings. In eight short years, Janet was blessed with the gift of five children from 1953 to 1961. All children attended U of S and received several degrees. Janet completed two degrees, U of S Art Degree (1984) and Advanced Art (1997). Together, they created a family farm and fully landscaped yard with several gardens, flowers, trees, shelterbelts and in 1967 a cement swimming pool enjoyed by generations of kids. They raised livestock (milk cows, calves, hogs, chickens, horses) and grain. Starting in 1966, Janet began a lifelong passion of building with field stones. There are barbecue, raised garden beds, chairs, benches, fences, driveway wall and pathways in Town and on the farm. Janet had three weddings in her yard and several years of grad and wedding photos. Devoted to their children, Janet involved her children in Church choir, camp, VBS and Sunday School, 4-H, Girl Guides, Boy Scouts, Dance classes, skating, toboggan runs, pony trails and for over 20 years a life-sized Christmas Nativity scene at the farm entrance. Janet served God in her vocations at home, gardening, church, school and in the community. Janet returned to part-time work at Churchbridge Elementary School when Murray was in Kindergarden. Then a full time Secretary, Librarian and Art teacher, retiring after 24 years. Janet was involved with Homemakers, Agricultural Society, Curling club, LWML and Missionary League of Lutheran Church, Art Club, Library Board, Churchbridge in Bloom, Trinity Church Library, Red Hat Society and Langenburg Art Shows (winner 1997 & 2018). Janet was predeceased by her husband Paul Scholz, her parents, Ewald and Alvina Kaeding, her father and mother in-law Walter and Clara Scholz, her sister Delores and brother in-law Glen Peterson, brother Roger Kaeding, sister in-law Rita Kaeding. Janet is survived by brother Lloyd Kaeding and sister in-law Phyllis (Roger) Kaeding; son Allan (Bev) of Saskatoon, children Aaron, Luke, Elysse; son Jamie (Janet) of Westbank, children Regan (Todd) and Rachel (Ben); daughter Susan (Al) of Balcarres, children Stuart (Caitlin), Maxwell, Stacy; daughter Sally (Roger) of Raleigh, children Chantal (Ben), Natalie; son Murray of Churchbridge. Great Grandchildren are from Rachel (Brendan, Logan, Blake) and Chantal (Adeline). Mom had a passion for life expressed by her creativity as an artist, teacher, gardener and infectious laughter with her many friends. She genuinely liked everyone. She had a positive influence on everyone she touched. A Funeral Service will be held for Janet on Saturday, December 8, 2018 at 2:00 pm from the Trinity Lutheran Church in Churchbridge with Pastor Arron Gust officiating. Interment will follow in the Churchbridge Town Cemetery. Should friends so desire, donations in memory of Janet may be made to Churchbridge in Bloom or the Trinity Lutheran Church Memorial Fund.